How's that for some northern exposure? 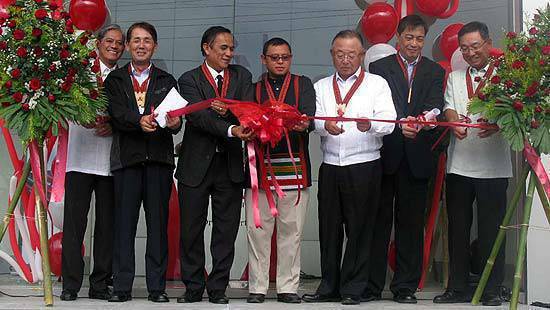 Mitsubishi fanatics up north now have better access to the Japanese carmaker's vehicles and services with the opening of Motorplaza, Inc., Mitsubishi Motors Philippines showroom and workshop in Baguio City. The new Mitsubishi facility has room for four vehicles in the showroom plus an adequate workshop area where the company can provide electrical, mechanical, periodic maintenance, overhauling and repair services. "We at Mitsubishi Motors Philippines congratulate Motorplaza, Inc. for bringing in to Baguio City, Northern Luzon's highly urbanized city, a closer reach to quality Mitsubishi vehicles, genuine parts, and total customer service satisfaction thru the opening of this dealership", Mitsubishi president Masahiko Ueki said in a statement. "With its great tourism industry and excellent economic profile and given its strategic location I am confident that MPI will continue to attain its remarkable sales and service performance." Motorplaza is Mitsubishi's 42nd showroom in the Philippines. Who’s who at the opening of Motorplaza Baguio. From left: Orlando F. Alvarez, Jr., Mitsubushi Motors Philippines senior vice president for treasury and marketing; Masahiko Ueki, MMPC president and chief executive; Baguio City vice mayor Daniel Fariñas and mayor Reynaldo Bautista; Taizo Furuhashi, MMPC executive vice president for marketing; Motorplaza Baguio’s Gil Galeste; and Tetsuya Wada, MMPC executive vice president and chief finance officer. Click this link to see the entire lineup of Mitsubishi vehicles in the Philippines.